This one is high qual, high rez rendered in After Effects. This animation was first created on a "render farm" of about 6 Apple //c computers. That was away back in the stone ages, around 1985. Yep. Took about 8 hours per frame some times, at what, 140 x 191? (each "pixel" of color is 2 dots wide). Wow, sure brings back memories. Anyway I rendered these 30 frames, back then, and the animation was a little jerky, but wow, it was extremely cool for it's time (IMHO). To get the animation smooth (ie: to create more in-between frames), I brought the 30 frames into After Effects (first had to write a program to read Apple II (Beagle Bros.) DHGR pictures and save them into Macintosh PICT, but eventually wrote a plugin for Photoshop (sorry, mac only) that reads DHGR)... Anyway, brought the frames into After Effects and comped them all together and did a smooth exponential zoom on it. Pretty fun :) New and improved! Updated to use new colors that look even more like my TV! Also around that same time I did a few frames of a Julia set zoom. 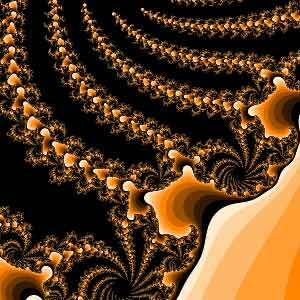 Not nearly as deep as the Mandelbrot zoom above, but still fun. Here's the original 6 frames. 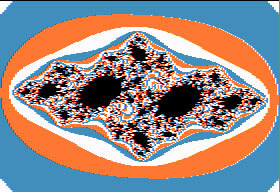 Click here to see several more fractals rendered on my Apple //c computer. This movie was made when I realised that After Effects would be the ultimate interface for creating animated fractals. So I wrote another plugin that lets you do just that. This one animates the "seed" for the julia set, looks extremely cool. 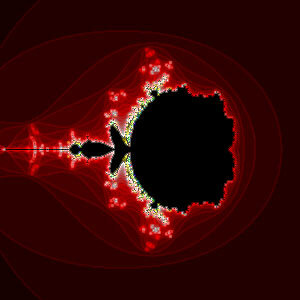 And then I thought, why not animate the "seed" for the mandelbrot set and see what happens? So I did and here's what I got :) Kinda nifty! Here's one I just made recently. 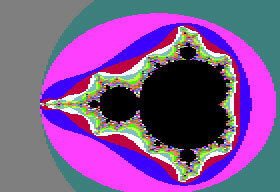 I got it by inverting the mandelbrot set and offsetting it by (-1). I know, it's not a very technically accurate explaination, write to me if you want some code snippets to help out. This site maintained by Me!